Did you know we also hold a Dart league here at Leroys? Make sure you sign up! Leroy’s has pool leagues on Monday, Tuesday and Wednesday nights. Call for details. Belting out your favorite song in your car or in your shower doesn’t always cut it. Sometimes you need an audience, a spotlight, and maybe a little booze wouldn’t hurt, either. People enjoy karaoke for all sorts of reasons, like rockin’ out with your family and friends, but no matter what your reason may be, LeRoy’s Bar has got you covered. We invite you to come pick out a song from any genre of music and let your inner rock star loose during our karaoke night! Are you looking to end your afternoon with one of your go-to refreshments? 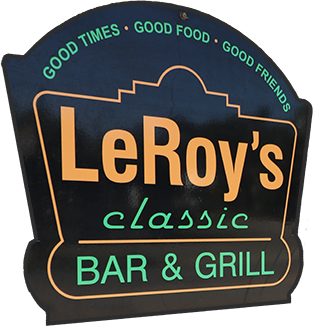 LeRoy’s Bar & Grille offers happy hour from 3pm to 6:30pm every week, Monday through Friday! The words “happy” and “hour” have appeared together for centuries when describing pleasant times so come meet your coworkers or socialize with your friends. We offer a full bar for all your favorite mixed drinks as well as have a wide selection of beers on draft or in a bottle! Are you and your friends looking to test your knowledge on a variety of topics? Leroy’s Bar & Grille offers trivia night every Friday night. Grab your family and friends, brush the dust off your brain, and get your team ready to compete with other trivia fanatics! Prizes available for each week’s winning team!